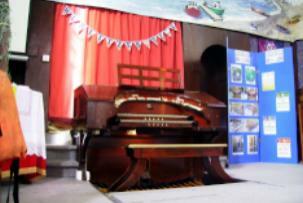 Friends of BeerWurly - The OLDEST Wurlitzer Theatre Organ in UK! 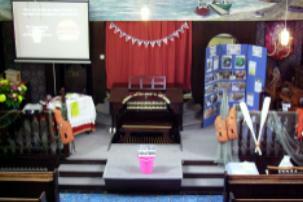 Wurlitzer Week commenced with the Matthew Bason Music Show. Using the Wurlitzer, his own Orla organ, electric piano and accordion Matthew presented an excellent and most enjoyable afternoon of entertainment and fun. The public were able to see inside the percussion chamber for the first time, thanks to newly installed windows. Just to make sure they did see it, Matthew played The Conga whilst Mike led them out! This "viewing" process seemed to take a lot longer than we had allowed for. The new percussion chamber is directly outside the toilets! Monday morning began with the setting up of our exhibition. 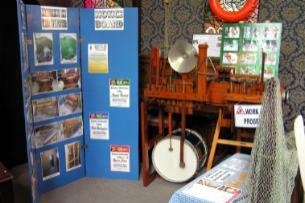 Display boards were assembled depicting the history of the Wurlitzer, and some of the restoration work carried out so far. The exhibition also included the Toy Counter which is currently being worked on, and also the original dynamo which was installed at The Picture House. 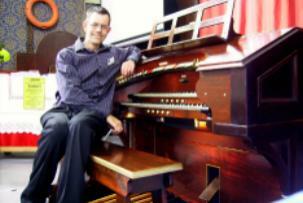 Once complete, Glen took to the Wurlitzer for about seven hours with only two short breaks. 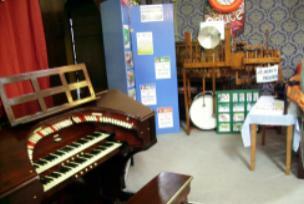 He soon realised however how uncomfortable a Wurlitzer organ bench can be! On Tuesday an "open console" day was hosted, giving members of the public a chance to take control of the Mighty Wurlitzer. Those brave enough to take us up on the offer ranged from children to professionals. Richard Monks dropped in at lunchtime and entertained for an hour or so. Richard certainly attracted a crowd for us. 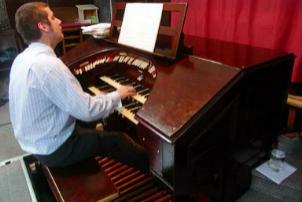 He was followed by classically-trained organist Ben Scott, who showed off the "straight" side of the organ. One of the highlights of Ben's performance was Widor's Tocatta from his 5th Symphony. 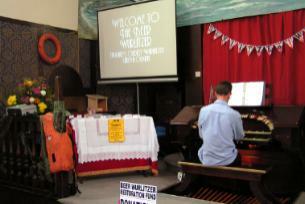 Wednesday started off with local theatre organist Trevor Bolshaw having a practice session on the Wurlitzer. This drew a few people in during the couple of hours he was there. 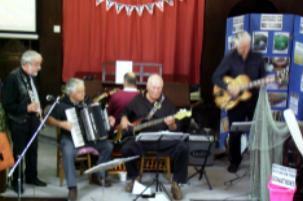 The afternoon saw "The Wurlyband" entertaining the public. 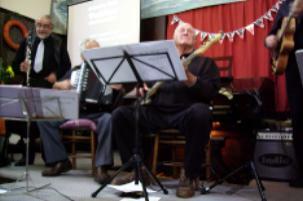 The group of musicians comprising clarinet, accordion, bass and guitar/banjo were ably accompanied by Mike on the Wurlitzer. The majority of their programme was 1920's and 1930's swing-type music. Between them they provided an afternoon of enjoyable entertainment. With so much use the Wurlitzer was starting to show signs of needing a little attention. The main tremulant had stopped working properly and the trumpet ranks had drifted out of tune. These tasks took priority before our "Great Organ Virtuoso" arrived. Upon Carlo Curley's arrival he had a busking session (as he called it) on the St Michaels Church organ, and also on the Wurlitzer. 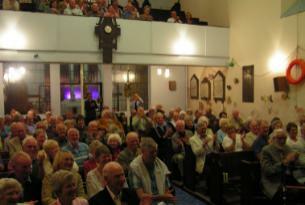 After a bit of a break our evening Gala Show commenced at St Michaels at 7.00pm. 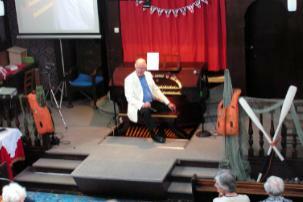 Carlo played works by Bach, Buxtehude, John Stanley and several others. After a buffet interval Carlo took to the Wurlitzer and entertained with the likes of March Militaire, Londonderry Air, Fiddle-Faddle and The Entertainer. 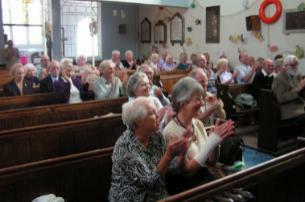 From the feedback we have received everyone seemed to thoroughly enjoy the show. 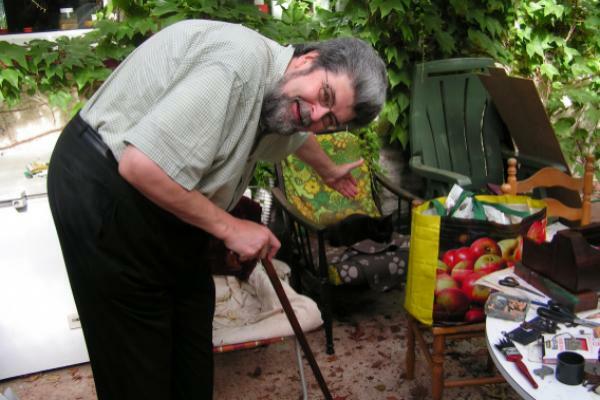 The photo above shows Carlo with Mike's cat Squidge the following morning, before Mike chauffered Carlo to Taunton railway station to catch the train to his next venue. 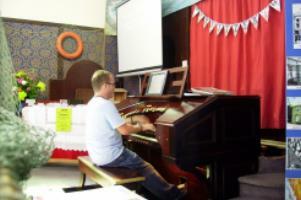 On Friday morning Glen took to the Wurlitzer again for a few hours before the lunchtime show - a glutton or punishment! The free lunchtime show was given by Chris Thompson. Chris played a variety of music including Blue Moon, Autumn Leaves, a selection of tunes with "summer" in their titles, To A Wild Rose, Down in the Glen, plus a couple of hymn tunes for good measure. 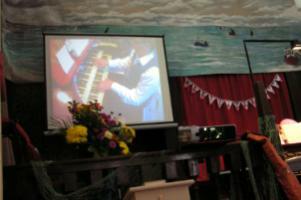 Videos of Chris playing the Beer Wurlitzer can be found on YouTube. The final day was soon upon us. It started with us having to carry out a temporary repair to the console's wind regulator which had sprung a leak! 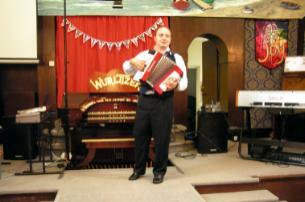 The finale show starred Trevor Bolshaw and, as usual, Trevor put on a fantastic show very befitting to the Wurlitzer. The second half took us on a musical journey through the "Roaring Twenties" and then into the 1940's. Again it was an excellent afternoon of professional entertainment. Profit made from the two shows at either end of the week amounted to �3. Takings on the Beer Wurlitzer gift shop during the week totalled �0. The generous donations we received in the the course of the week amounted to �5. This gives a grand total of �8. The final figures for Carlo's Gala Show however have yet to be agreed. 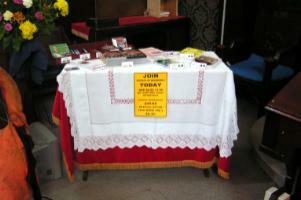 I have noted the lack of interest on the part of members of one particular theatre organ Group - UKCO on Yahoo - in our fundraising week. Thanks for your support Guys. This just re-enforces my earlier view that whilst generally pontificating, criticising and self-opinionating regarding all matters concerning theatre organs; the majority of them are incapable of achieving anything constructive! Wurlitzer Week Gallery A selection of photos taken at random during the week.